Blog Financing Your Project	What factors impact the cost of a new front door? Front doors can take a beating over the course of its operational lifetime. Your entry door, sliding patio door, and garage door are most likely opened and closed a dozen times a day or more. And over time, effects from rain, wind, and the sun’s rays can damage your door. All of this wear-and-tear can create problems with how effective the door is concerning energy efficiency, operation, and security. According to the Cost vs. Value Report, conducted by Remodeling magazine which analyzes remodeling projects, replacing your entry door with a new steel front door replacement will yield up to 117.6% return on investment in the Baltimore/Washington DC Market. In addition to adding to your home’s resale value, a new exterior door will instantly add to your home’s appearance. But while giving you a positive return on your investment, what does it actually cost to replace your home’s front door? Costs will vary depending on a number of variables. Entry doors are available in a number of materials, including wood, steel, fiberglass. Each material has their own benefits. But a steel front door can be anywhere from 10-20% less expensive than a fiberglass or wood front door. Steel doors contain an insulated core that creates a thermal barrier, making the door more energy efficient. Besides the material used to construct the door, there are many options available for doors that can affect the cost. Door hardware – including locks, door knobs, and hinges – can run the gamut from simple to extravagant. The type of metal used to construct the hardware as well as the finish will vary in price. The type of locks you choose will change the price as well, with choices ranging from deadbolt lock, mortise lock, rim lock, and night latch styles. Many door openings include room for additional decorative accent pieces. Sidelights are window panels that flank either side of the door, while a transom is a glass window panel above the door opening. The glass package for doors, sidelights and transoms are the most costly part of an entry door. A door with no glass is the least expensive option, followed by clear glass. Decorative glass, including textured glass and stained glass designs, can cost over 40% more than clear glass or no glass options. Having an entry door installed can cost anywhere from 20% to 30% of the total door price. Installation costs can vary depending on the complexity of the installation. If a pre-hung door fits well into the existing opening, the installation is usually straightforward and will be the least expensive type of installation. If the install requires any reconstruction work, such as building or enlarging the door frame or creating a new rough opening for transoms or sidelights then the installation costs will be higher. The warranty for your new front door may or may not be factored into the total price for the door. Looking at the warranty terms can provide a good indication of the company’s reputation and the quality of their products. If a warranty is limited in the period of time it covers or limits the dollar amount of any future expense related to the warranty, then the door quality and the company behind it can be suspect. If you encounter any issues with your door due to improper installation or product defect, selecting a company that provides a comprehensive long-term warranty will save you time and worry in the long run. Otherwise, you could be looking at an increase in ownership costs if you have to repair an exterior door that is either beyond its warranty period or has an issue not covered by the warranty. 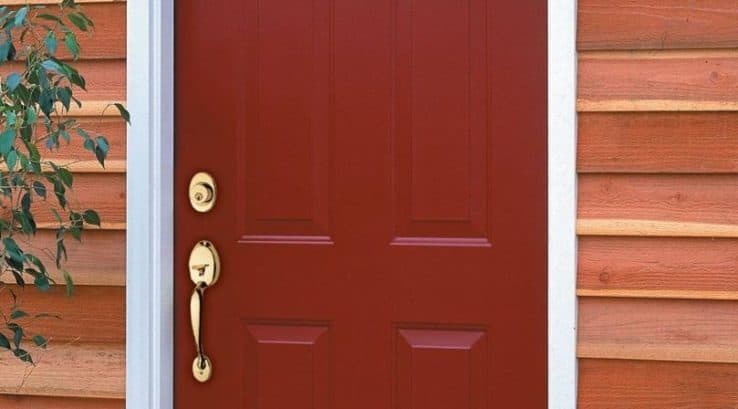 So there isn’t a simple answer to the question, “How much will it cost to replace my entry door?” You need to consider factors such as the door material, options, and glass package, as well as the installation and warranty. But you can be assured that replacing an aging front door will boost your home’s curb appeal, save you money by being more energy efficient, and help you recoup some of your expense when the time comes to sell your home. Hi, my name is Debbie and I have a question. I need a doggie door inserted into the sliding glass door, I’m told it is possible. Do you do these? Hi Debbie! Yes, we offer a wide variety of doors and we’d love to discuss your project with you. Please give us a call when you’re ready! We offer a wide variety of doors, and would love to work with you on your project. Please give us a call when you’re ready! Thanks for pointing out that steel doors are more energy efficient, since their insulated core provides a barrier against heat. My husband and I need to get a new front door for our home. I like the modern look of steel, so I’m glad to hear it offers other benefits as well! We’re happy we could help, Amy!